The meeting of the 32 District Agricultural Association Board (the Fair Board) that had been hastily scheduled for 4:30 January 1, 2011 - Saturday - has been canceled. HERE. THE OLD "QUIT CLAIM SHUFFLE"
This is the meeting that was supposed to see the Fair B oard do a Quit Claim Deed transfer for the Fairgrounds to the 32a DAA - basically itself in a different dress. The 32a DAA was established back with the original legislation that authorized the sale of the Fairgrounds many, many months ago as a property transfer entity. Many of us watching this drama assumed that this move by the State was to circumvent the legal stall presently placed on the sale. We don't know exactly what pressure was brought on the Board, but I suspect it was the probability of their actions violating the Temporary Restraining Order currently in effect. It is our understanding that there will be a hearing on February 8th at which time the Appellate Court will announce it's decision regarding the legality of the State trying to sell the Fairgrounds to a private entity - in this case, Facilities Management West. I'd tell you all to relax for a month or so now, but every single time I start thinking like that something else hits the fan. This whole thing is like Groundhog Day - it just never stops! 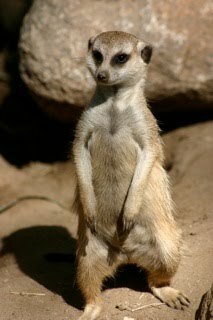 So, like my meerkat buddy here, stay alert!